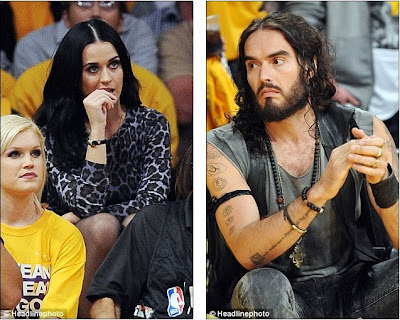 It's that awkward moment that nobody ever wants to happen, but it inevitably did for Katy Perry and Russell Brand. The ex-husband and wife both turned up to watch the Los Angeles Lakers take on the Dallas Mavericks at the Staples Center, in California, on Tuesday night. The former star crossed lovers tried to play it cool as they must have been aware that they were on a collision course to bump into each other. While Katy, 28, had some emotional support for the confrontation in the shape of her father Keith Hudson, Russell, 37, was flanked by two young boys. 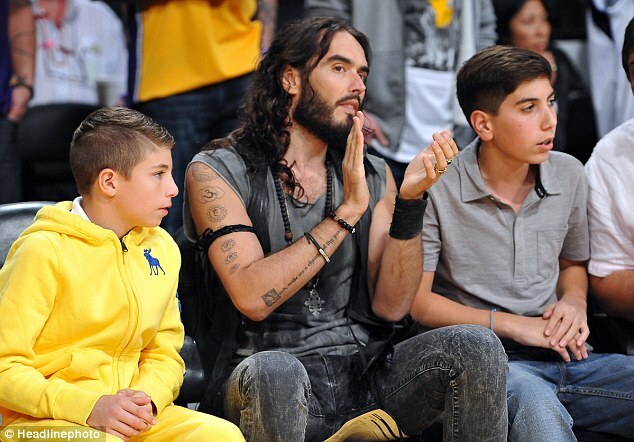 Brand was certainly not dressed for the occasion and let himself down in his typically casual wear. 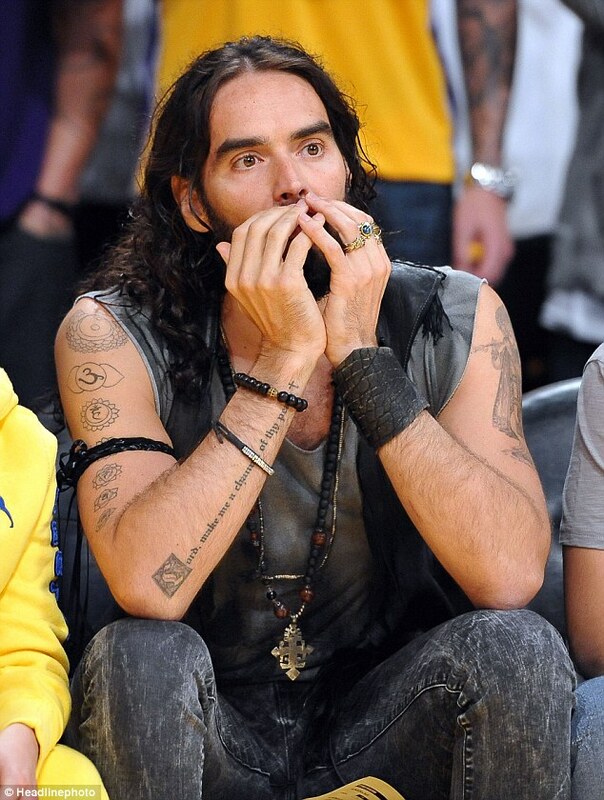 He wore a pair of skinny grey jeans with a sleeveless grey top and a black leather waist coat. Katy, on the other hand, looked amazing as she showed her ex exactly what he has been missing by slipping into a tight dress. She showed off her curves in a violet leopard skin print dress and wore her hair down over her shoulders with a centre parting. Despite her scene stealing outfit, Katy looked a little nervous as she sat biting her nails while watching the basketball game. 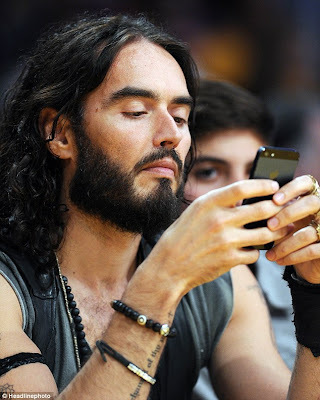 Russell seemed equally tense and played around on his phone in between passing on some words of wisdom to his young friends. Eventually, however, Katy got into the swing of things and was cheering and whooping her way through the match. The Teenage Dream singer even enjoyed a beer as she spent some quality time with her father. 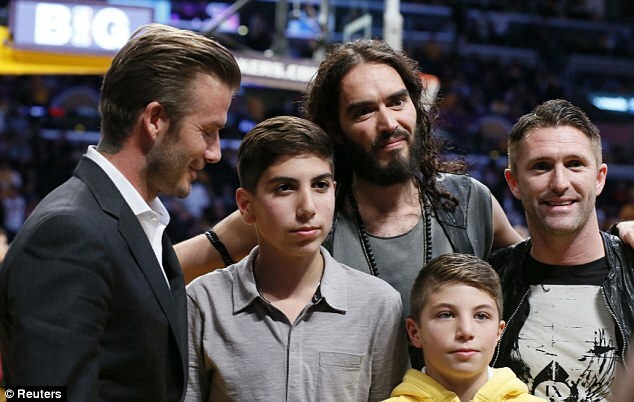 In Russell's time of need there was only one man who could help him get over the awkward situation - David Beckham. 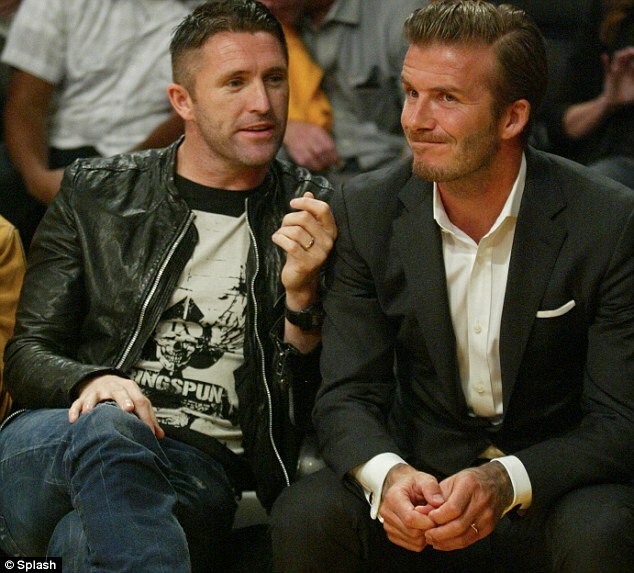 The English footballer was sitting court side with LA Galaxy team mate Robbie Keane and was looking pretty sharp. Beckham was at his dapper best in a dark grey suit as he sat next to The Voice judge Adam Levine and his girlfriend. 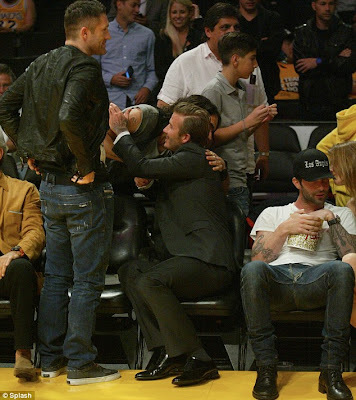 Brand, who was pictured recently hanging out with Victoria Beckham, was happy to see his friend and gave David a big hug. With his two wing men by his side, Russell had a renewed sense of confidence and posed for pictures on the court. After the game was over Katy, fresh with some new inspiration, headed straight to a recording studio to lay down some vocals.